Rob and I arrived at the Valentine Hotel Hue just before dark. The staff met us with glasses of cold lemon tea, which was amazing. I absolutely need to figure out how to make it. They had us a triple room on the 5th floor; the shared floor balcony had a nice view of the city. 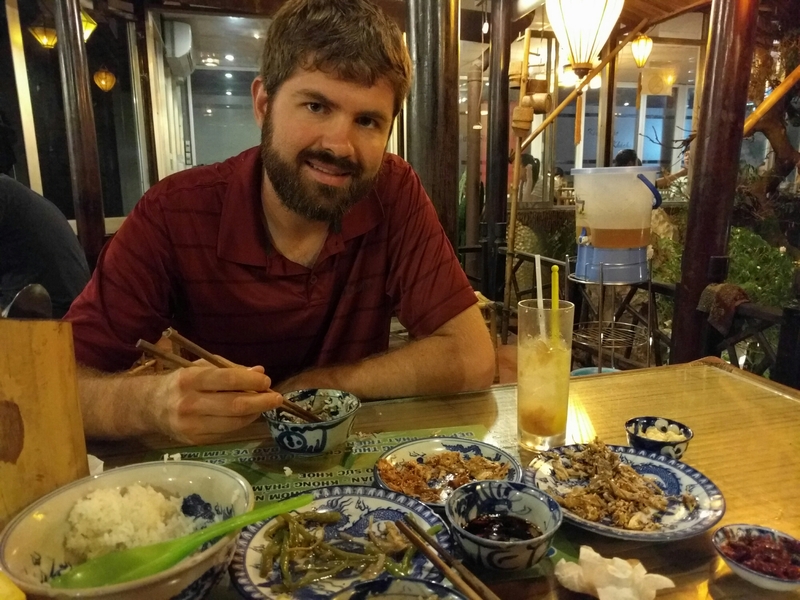 After unpacking and changing, we spent some time looking into visa extensions as we only had 10 days left on ours and had only made it to central Vietnam. Quickly, we realized that we would need to get our visa extensions in Hue otherwise we might not make it to Hanoi before they expired. Walking around town and asking travel companies about visa extensions, the only place we could find that would do them was the Hue Backpacker Hostel, which charged $65 each for another month. We brought them our passports Saturday night and they said they would be back from Hanoi Tuesday afternoon. Not too bad, but it meant one more night in Hue. We also did the very important errand of dropping off our laundry. It’s usually about 10,000 vnd/kg cheaper to take it to a place yourself rather than go through the hotel. We found a nice woman with a Tap Hoa to do our laundry a couple short blocks away. Having an extra two days in Hue, Rob and I didn’t feel any urgency to check out the sights right away. We took the morning to do some trip planning. With our departure date set, we started looking forward to planning our next week exploring DMZ and Phong Nha-Ke Bang National Park via some remote beautiful stretches of road. The only catch is that we were told that for the really remote section you should have a riding partner. I was of course more concerned about this than Rob, so we looked into a variety of options for DMZ tour as well as hiring an easy rider type guide for the whole stretch from Hue to Phong Nga. After a flurry of emails, we headed out for lunch and a visit to the Imperial City. We didn’t make it very far before deciding to stop for a quick bite of dessert to hold us through the walk to the Citadel. 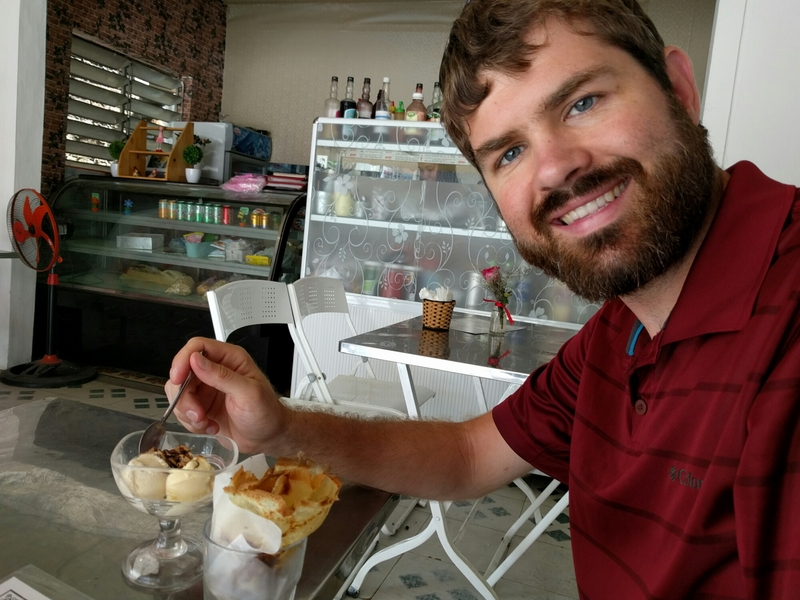 Ice cream in Vietnam has actually been on the expensive side, so we were thrilled to see a dish of ice cream for only 10,000 vnd. They also had crepes with mango or banana for the same price. YUM! So we might have had dessert on the way to lunch. Google didn’t approve my map edit, but SOB cake is somewhere around here and is a great spot for a snack or light dessert. They aren’t open too late unfortunately. The walk to the old town/Citadel area took awhile, but we finally made it and arrived at a restaurant, Cafe Bao Bao, that lonely planet recommends for cheap pork kebabs. Since we were late to lunch, it looked deserted and we almost left. A guy sitting across the street noticed our indecision and told us to go inside. They has an English menu and turned out to be variations on beef on a sizzling plate. Rob had the straight beef plate for 50k and I had the steak and eggs for 40k. Everything was fresh, hot and amazing. We had walked a ways out to get to this place and it was worth it. Stuffed with food, we headed to the Imperial City and another decision point. The ticket for the Imperial City is 150,000 vnd or $7.50. If you buy a combo ticket with the Ming Mah, K Dinh and Tu Duc Tombs, it’s only 360,000 vnd (and savings of 90,000 vnd or $4.50). We wanted to do the Tu Duc and Ming Mah after reading Lonely planet and trip advisor, so we nixed any thought of visiting the DMZ the next day in favor of the tombs, as the combo ticket is only good for two consecutive days. This meant that we would be visiting the tombs on Monday, hanging around on Tuesday then touring the DMZ on Wednesday. The imperial City of Hue is actually pretty recent as far as these things go. This complex is where the kings of the Nguyen dynasty have lived until 1945 when the last one abdicated to Ho Chi Minh. Most of it was destroyed during the war and bullet holes can still be found around the complex. Entrance gate. Lots of restoration done. The gardens here like animal forms. We also saw many birds and other creatures throughout the grounds. The Immperial Tennis Court in Hue Imperial City. It reminds you that the grounds were used until 1945 by royalty. Religious area of the city. We were tired and ready to cool off by this point. After all this walking, we were pretty tired and returned to our hotel for some relaxing. Eventually we headed out for dinner, but by that time the restaurant recommended by the hotel was closed. Rob and I ended up getting some expensive meh noodles in a street side cafe. Can’t win ’em all. The next day, we planned to visit the tombs. During our relaxation time the prior evening, we had found a post on the Vietnam Back Roads Facebook group about someone looking for a riding partner for the remote highway stretch we were planning to do. The only catch was that he wanted to go Wednesday and we were stuck in Hue until Tuesday afternoon. Rob went ahead and sent him a reply stating our plan to do the DMZ on Wednesday and complete the remote section on Thursday. As we were leaving the room, Rob noticed that Max had sent him a message back and we eventually agreed to meet up later that night. We set off on the motorbike toward the Ming Mah tomb, however, when we were still a few km away we passed another tourist attraction. It was one of the other tombs we planned to visit later, but we went ahead and did it then since we were there. The Khai Dinh Tomb was incredibly well-preserved, however, it only dates from 1925. If it hadn’t been on the combo ticket, we wouldn’t have gone based on the Lonely Planet write-up. This ended up being our favorite of the tombs as the inside has quite spectacular mosaics. Mandarins and creatures immortalized in stone to served the deceased. Building housing a plaque detailing the King’s life. This one was written by the son about the father. All of the tombs we visited have one, but the plaque in Tu Duc’s is an autobiography rather than a biography by his son. Mosaics up close. I love all the different textures. The room in front of the tomb. Beautiful mosaics on every surface. This tomb was quite grand set out on a series of lakes and ponds. One pavilion had some chairs in front of a fan that we were quite enamored with. This tomb was closer to town and quite large. At one point, this was more like a second imperial vacation city with over 50 buildings. Apparently its construct caused major cash flow issues for the empire and wasn’t popular with the conscripted labor. The complex seemed to stretch forever as our interest waned. As we walked around, we kept finding signs to more and more sights, including the the tombs for the Empress and Emperor Kien Phuc. Tu Duc, who built the complex, is not actually buried here; his secret burial location (and the treasure?) is unknown as all the servants who buried him were beheaded. Most of the tomb wasn’t too exciting and followed the pattern of the other two we’d seen earlier, however, the entrance area is quite nice with a large and a large island where the Emperor used to hunt. The lakeside had a couple shady pavilions to enjoy the view and listen to the traditional singers and musicians performing. Every tomb had the same basic elements, including these large stile. We met up with Max from Belgium, who we’d messaged about riding the remote highway with, at the hostel’s happy hour. He’d been riding with another guy, but had been detained in Hue for an extra stretch. 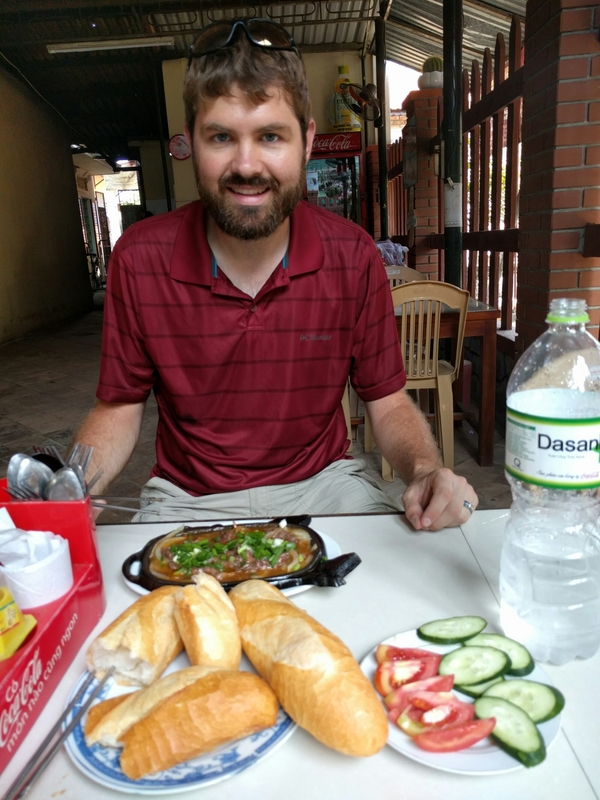 Max wanted to ride a southerly stretch of the Ho Chi Minh highway from Hue to Khe Sanh, but agreed to join us on the DMZ tour (through Tam’s Cafe) on Wednesday and ride to Phong Nga on Thursday. We planned to convene in Dong Ha on Tuesday night. Looking for dinner, Rob and I looped back to the streetside restaurant strip we had scoped out our first night in Hue. I had translated the sign and we knew they served a collection of spicy grilled things. We didn’t quite realize it was grill your own, but we quickly found out. Rob stoking our fire at a Nuong cay restaurant in Hue. This is where we ate, but the road is lined with a bunch of them. The women in charge didn’t speak English, but she gave us suggestions and tried to be helpful. Ca keo = goby. You just eat them off the stick like corn on the cob. We returned to the hostel and hung out with folks until the wee hours not having any real plans for the next day. We learned some choice German words and played Jenga with some Brits. This was the first night in awhile that I’d stayed out really late with Rob. On our way walking back to the hotel, he was offered a number of things by the taxi drivers that he’d mentioned before but I’d never witnessed: Rob receives constant questions of Marijuana?, or Lady lady?, while walking around in the evenings. On our last day in Hue, Rob and I attempted to sleep in, but sometime around 7 am, the pounding began. Someone was hammer drilling the tile on the opposite side of the wall from our heads. Trying in vain to rest, we finally gave up around 9:30 am and went to breakfast. You could still hear the pounding four floors door but the volume was more manageable. After packing up our belongings, we hung in the lobby and caught up on internet for awhile before heading to lunch. I was afraid that we’d be on a Vietnamese food only trail for the next bit, so I talked Rob into Indian. Afterwards, we did errands – picking up the passport and getting an oil change and minor tune up for the bike. Our hotel manager sent us to Thien, motorbike mechanic to the backpackers, who is located somewhere around here. He was amazing and noted almost the the issues we’d had with the motorbike after a short test ride. It was our most expensive mechanic visit yet, $40, but he fixed everything – new back tire, new back tube, repaired electric starter, new clutch cable, new headlight, new front shock seal, etc. The mechanic visit took way longer than we expected but finally, we were on the road to Dong Ha at 6:15pm catching the last bit of daylight as we hit the highway north. Thien motorbike repair. The owner speaks English and does an amazing job of diagnosing bike problems. We had so many things fixed here before heading to the Ho Chi Minh Highway.